Ginger essential oil, ECOCERT, Fresh, Madagascar, the sweet, fruity-spicy scent is reminiscent of the fresh root. It is highly beneficial in combating depression. It has also proved its effectiveness in relieving pain. Ginger essential oil is sought after due to its aphrodisiac and stimulant properties. Ginger herb is extensively bought to use for its moisture retention characteristics. It helps a great deal in toning the body. It serves as the best remedy to fight against Malaria. Ginger is steam distilled from dried rhizomes with yields around one percent. The natural chemical components are farnesene, methyl heptenone, cineol, borneol, geraniol, and linalool. The health benefits of ginger root oil can be attributed to its digestive, carminative, expectorant, antiseptic, analgesic, anti inflammatory, stimulating and aphrodisiac properties. These benefits of ginger oil include its ability to treat stomach problems, nausea, heart strokes, indigestion, inflammations, respiratory problems, menstrual disorders, etc. Ginger is a commonly used spice, which has originated in India. The spice is very common in India (known as adrak in Hindi) and China and is now used all over the world. It forms an integral part of many Asian cuisines due to its digestive properties. It is especially helpful in digesting food items such as meat, and poultry and is added while cooking meat as it softens the meat. Ginger root and ginger oil are also used as preservative and flavoring agent. Ginger oil is obtained from the root of the herb Zingiber Officinale. The peculiar hot taste and pungent taste of ginger can be attributed to the presence of an acrid compound called Gingerol. Most of the health benefits of ginger are due to Gingerol. Stomach: Ginger root and ginger oil is often used for stomach upsets. It is one of the best remedies for indigestion, stomach ache, dyspepsia, colic, spasms, diarrhea, flatulence and other stomach and bowel related problems. Ginger or ginger oil is often added in numerous food preparations, especially in India, as it helps in improving digestion. Ginger tea is also used for relieving stomach problems. Further, it increases the appetite of a person. Food poisoning: Ginger is antiseptic and carminative. As a result, it can be used for treating food poisoning. It is also used for treating intestinal infections and bacterial dysentery. Nausea and Vomiting: Research has proved that ginger root and its oil is also effective against nausea, motion sickness and vomiting. Usage of ginger may result in reduction in pregnancy related vomiting as well in women. Respiratory: Since ginger root and ginger oil is a good expectorant, it is effective in various respiratory problems such as cold, cough, flu, asthma, bronchitis and breathlessness. 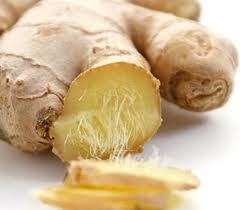 Ginger is very effective in removing mucus from the throats and lungs and hence it is often added with tea in India. The health benefit of honey and ginger in treating respiratory problems is well known. Inflammation and Pain: Extract of ginger is often used in traditional medicine to reduce inflammation. Research has now proved that its anti-inflammatory properties can be attributed to the presence of the substance named Zingibain. It is analgesic in nature and reduces pain caused by muscle aches, arthritis, rheumatisms, headache, migraine, etc. Ginger oil or paste of ginger is often massaged on aching muscles to remove muscle strain. It is further believed that regular use of ginger leads to reduction of prostaglandins which are the compounds associated with pain. Hence ginger helps in pain relief. Recently a few Chinese researchers have reported that ginger is effective for treating inflammation of the testicles. Hair: Ginger is useful for hair care as well. Usage of the juice of ginger is useful in controlling dandruff. Cancer: According to the American Cancer Society, preliminary research on animals has shown that ginger may be useful in treating cancer through chemotherapy.